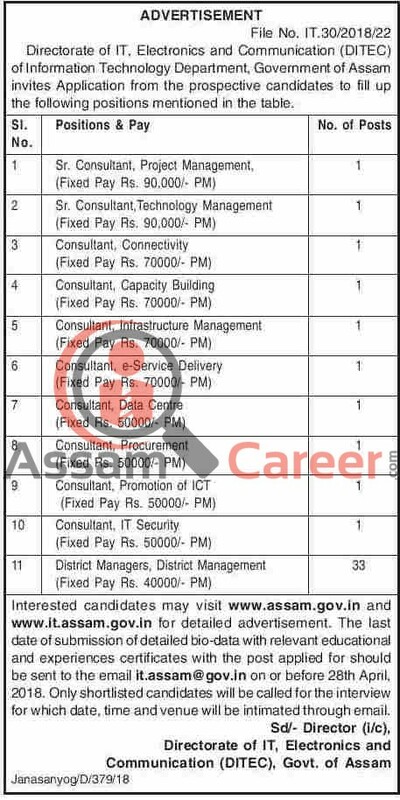 Directorate of IT, Electronics and Communication (DITEC) of Information Technology Department, Government of Assam invites Application from the prospective candidates to fill up the following positions mentioned in the table. How to apply: Interested candidates may visit www.assam.gov.in and www.it.assam.gov.in for detailed advertisement. The last date of submission of detailed bio-data with relevant educational and experiences certificates with the post applied for should be sent to the email it.assam@gov.in on or before 28th April, 2018.